Consultation: I meet every single couple to review your wedding day/night. We select “your song” and all your other favorites. You also get to tell us what you DO NOT want to hear. It is your special day and night and we give you lots of opportunity to shape the music that you hear. You can also supply your own CD’s for the DJ to use if they are not in our 1000+ CD collection. That way you get to hear absolutely all your favorites and on your wedding day you no longer have to worry about what the DJ is doing. The consultation like everything is included in the price. Dinner: During dinner you can expect to hear wonderful Jazz, Spanish guitar, Contemporary Favorites. You will pick that during the consultation. 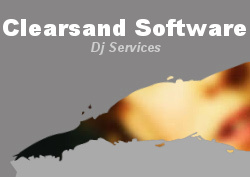 Many clients supply their favorite music or go with the many different dinner selections Clearsand has in its library. You are never expected to feed the DJ but we do appreciate it when you do. Speeches: If you MC does not have a PA system you can use ours. We will provide you with a cordless mike and the sound equipment your MC will need. We our also willing to play musical queues or be part of games people play at weddings. Dance: We recommend to our wedding couples to choose the first few songs of the dance. We will make announcements and toss the odd bouquet. We try to keep our chatter to a minimum and the music continuously playing until the end of your dance. We do not ask for additional fees if the party goes later than you planned. Sound and Lights: A dance is no fun without superior sound and lights. Clearsand has awesome sound equipment for crystal clear dinner music and rocking sound for the dance. We also have over 2000 Watts of awesome lights. Check the web site for demos of just a few of the lights we use. Special Guests: Usually we are able to provide a PA system for your favorite family member or friend to play their guitar or instrument of choice and a mike. Beyond that Clearsand unfortunately will have to charge a wee bit extra if you want a whole band to play at your wedding. Anything else we should be able to handle it.